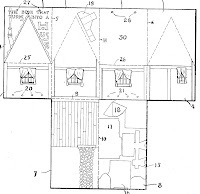 Google Patent search for Lelia May Fellom. There are nine dolls. 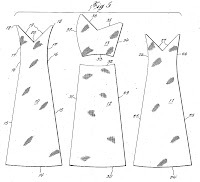 These patent drawings for slips are interesting for summer play dresses for me. I'm a slender 4'11" and like dresses to have fitted waists and not a lot of fabric. Pick one measurement ( upper back side seam to side seam) on these drawings to proportion the pattern up. 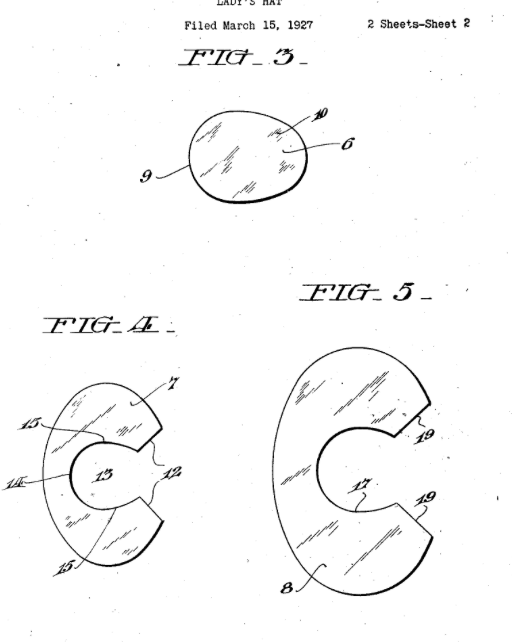 Click the pictures to download the patent drawings. This first pattern is cut on the bias and fits the bust in an interesting way. This pattern has a unitary bodice and front panel combining the darts and front seams. The skirt has flare but not a ton of gathers. Princess seaming and side panels provide fit. I like the waist fit and two way bust fit. 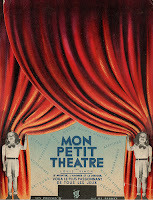 Patricia (Agence Eureka) is sharing again. 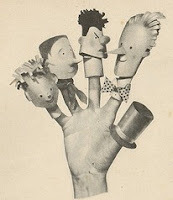 This cut out paper finger puppet theater book is offered in full size, high resolution scans. Click on all sizes for each page and download the original size. Sets, characters, props and costumes are ready to cut out and assemble. Also included is the cloth hand covering pattern. Adorable project to save a mother's sanity. Click here to be taken to this Flicker set of the entire theater. Each picture is a link to a patent with more information than I'm showing. This form by Marie Lord is about fitting to the pattern instead of the body. These two are for fitting to the body with tape. This pattern is about the changeable nature of the garment. For me it's about the shape. It could be a blouse, a shortened cape or a coat. Potential in that shape. Click the pictures. 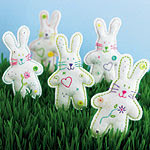 From the Craft Archive of Woman's Day magazine, these 6" stuffed felt bunnies embellished with buttons and easy embroidery (only two simple stitches are used), they're easy and fun to make. The archive is extensive and searchable. This pattern seems to have been removed from the archive for 2009. From the fabulous Online Feature Library of Threads magazine. 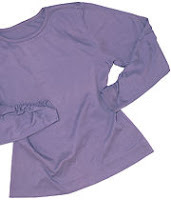 Fellow Oregonian Marcie Tilton wrote Not Your Ordinary T-Shirt; Customize a regular pattern for an elegant knit basic you'll sew again and again. Advice on fabrics, finishes and shaping. Marcie offers Where Did You Get That T-Shirt CD-Rom on her website that covers this topic in depth. This article was published in the first Threads magazine I purchased and I've been hooked since. Try the magazine, visit the Threads website. You'll be sure to learn something that will improve your sewing techniques. 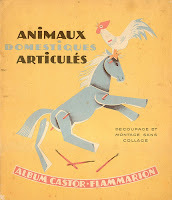 Patricia, my French friend at Agence Eureka, has posted some vintage paper cut out animals for us to play with. I swear, she has more vintage images of all kinds and wants you to snag and use them in your art or entertain your children. 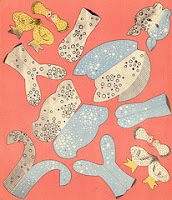 She posts full children's books, paper dolls and ephemera of all kinds. Be sure to check out all her categories and her Flicker too. She also has albums on Webshots. I'm crazy for the "bunny bowl" and have made it large and small. It looks good with paper doily quarters on the inside of the "bowl" pieces. This site has really grown since I last visited. Patterns for hat, baby shoes, bags, garments and accessories. It's in Japanese but the instructions include clear pictures. 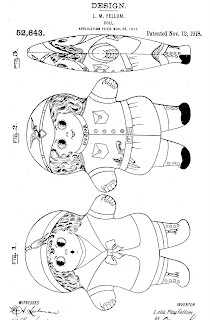 Tutorial and instructions are written by Runo, doll maker. Printable patterns. 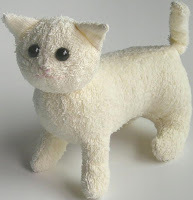 Love that terry cloth kitten! Suzanne shares project, a non-commercial site offering free online printable sewing patterns for baby clothes. She also has a links page. 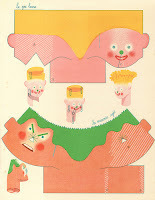 This paper chair template in the Tempting Template Archive at Stampington and Company. Click here to see more templates. Doll dress hanger by Rose Borden, owner of The Debby Doll Dress Co. I posted a pixie hat so maybe you might want to look at these pixie shoes designed by Henry Irwin. Back in the days before walk in closets there was a hat storage issue. Hats that could be stored flat became fashionable. 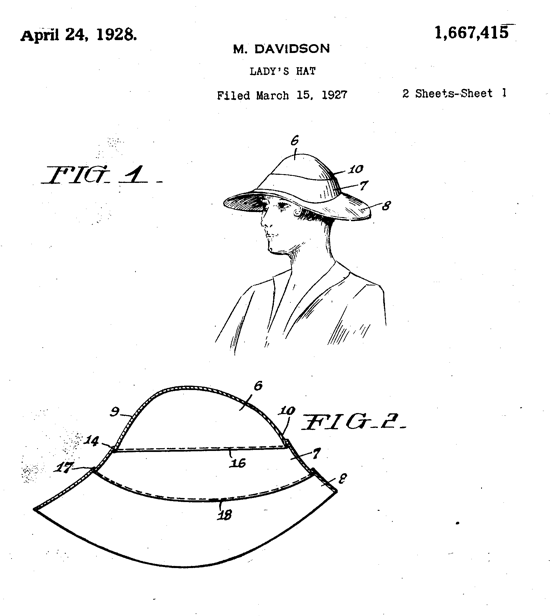 The three patent designs shown here could be the starting point for some cute hats today. The fourth hat is just plain easy too though I would probably sew them all into the final shape. 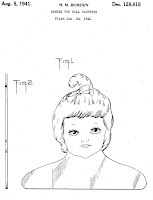 Click the pictures to be taken to the patents. If anyone makes anything from these ideas please show me!